I've been impressed with Dauntless Point, as seen from the southwestern cliff on Mount Brown. The point sits to the west of Mount Brown, south of Port Arthur. 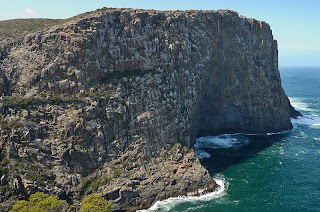 This walk starts at Remarkable Cave, and follows the same track as the Mount Brown and Crescent Bay walk(s). Description of that walk here. Walking to Dauntless Point didn't look too hard, so this was the aim. The point itself has a pretty impressive cliff, maybe 100m high, and sits below the cliff of Mount Brown, which is about 170m. You can sit right on the highest point of the Mount Brown cliff and look down to the sea - it seems close to vertical from the top, but it's always hard to tell whether a cliff really is vertical from above - for me anyway. Walking to Dauntless Point involves climbing to about the 100m level up the normal Mount Brown track (I went a bit higher actually) and then sidling back on steep sloping rock, boulders and scrub to the northwest and then west. There's a sort of saddle between Mount Brown and Dauntless Point, which drops very steeply (and dangerously, with loose pebbles and gravel) into a gulch to the south. I think Dauntless Point could be approached from the north directly, but there's a fair bit of woody scrub, and there may or may not be a clear path. Sidling round Mount Brown wasn't too hard. From the saddle, you climb easily onto the highest point and then beyond, with occasional pushes through bits of scrub, and a couple of points where the track is very close to the impressive cliff. With the wind blowing it was interesting, but not too problematic. I think those who don't like heights would have problems, as the cliff falls away in a clearly visible slope from several spots. The views of the cliff on Mount Brown are superb. There comes a point where the scrub thickens and the slope steepens significantly, and I didn't go all the way out to the end of the point. Maybe next time. This cliff on Mount Brown's southwestern side is about 170m tall. The picture above doesn't really do it justice, but a tall person would be 1/85th of the height of the cliff. You can stand on the highest point visible in this picture, and would be visible in a picture like this,but very tiny. The cliff appears to slope outwards from that highest point, but is then basically massively undercut. There is a big sea cave at the base of the cliff, and the whole cliff sweeps inwards to it. The (guessed) 4m swells were making a good show as they rushed inwards. 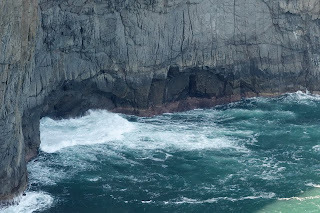 The dynamics of the water rebounding from the cave suggested that it is reasonably deep. Mount Brown must one day collapse at this point - and indeed to cut the cliff as it is already there must have been significant collapses in the past. Anyway, the view is pretty impressive. Note: there is no marked track to Dauntless Point, there are no safety features or warning signs, and the whole area has numerous huge cliffs which would be fatal if toppled off. Use this area at your own risk. Keep children close.